Do you still remember Hiccup and Toothless? After How to Train Your Dragon (Chris Sanders, Dean DeBlois, 2010) who won the Best Animated Feature category at the 83rd Annual Academy Awards and How to Train Your Dragon 2 (DeBlois, 2014) which was able to collect commercial revenues in excess of US $ 600 million that outperformed the predecessor's commercial series, DreamWorks Animation has now released the latest film from the How to Train Your Dragon series - which is also the latest series, How to Train Your Dragon: The Hidden World. 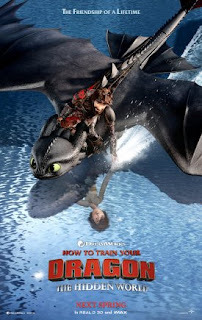 1 Response to "How To Train Your Dragon: The Hidden World (2019) Movie Review, Synopsis, Trailer"
That’s incredible. I am sure that this will be in our watchlist. My cousins were planning to watch the shows together on every weekend and I have told them to count me in. Thinking to suggest them the awesome shows by Andy Yeatman too because these are entertaining and family friendly as well. Marshmallow is Not Good For Children Health! What is Cholesterol and How to Prevent it?